If you are ordering a subscription to be delivered outside of the U.S., please email circulation@nebusinessmedia.com for a rate quote and to place your order. Credit card statements will show payment to New England Business Media. The HBJ Today will keep you informed quickly and easily with Hartford’s top business news stories emailed to you every weekday by noon. Add the CT Morning Blend to your wake-up routine and stay up-to-date with the most relevant news stories across the state, delivered to your inbox daily by 7:45am. 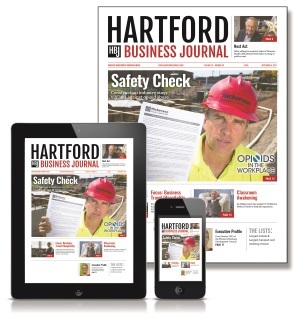 Stay connected to Hartford's business community with updates and information on HBJ awards and events emailed to you every Monday. Keep up with the latest news and current issues facing Connecticut’s health care industry with CT Health Care Weekly. Delivered every Wednesday afternoon. For our readers doing business in Greater New Haven, New Haven Biz covers the top business news in the region. Delivered weekly on Tuesdays.